3. How does Escooter move? How does it balance? 4. 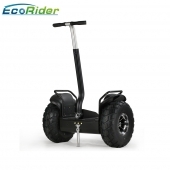 Is it safe for driving Escooter?Will it fall down if the speed is too fast? 5. What is the road and weather condition for driving Escooter? 6. Where is Escooter can be used? 7. How to buy from your company? how to pay? 8. How can i do if Escooter is not working? 9. How to maintain and clean Escooter? It's our brand. 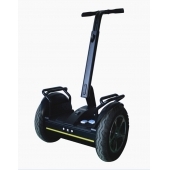 We aim to be the most professional manufacturer of electric self-balancing scooter in China. Focus makes us professional..
How it works--Move according to your body’s gravity. 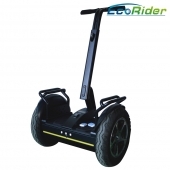 To move forward or backward on the Escooter, the rider just leans slightly forward or backward. To turn left or right, the rider simply moves the handlebar left or right. Stand straightly, you will stop moving. You get the sense of power and speed, yet you also feel a sense of safety and absolute control, it all feels natural, safe and instinctive. Escooter senses the lean of the rider with the assistance of two-dimensional inertial navigation system and two accelerometers that sense the angle of the Escooter with respect to gravity at 100 times per second. It balances the rider by applying forces to the ground in the direction of the lean. 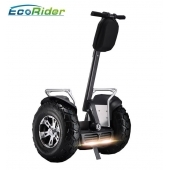 If you lean forward the Escooter applies motor torque to the wheel to push it forward, bring you upright and balance you. When you lean back, it applies reverse torque to slow you down and balance you accordingly. Escooter has safe alarm system,when you drive too fast,It will alert and control the scooter body directly.The speed will be reduced to the safe level.But you need pay attention to the road,do not keep it drive on complex road. Escooter does not fall itself. Mostly drives fall down because of its body lost balance. When drive jumps off, Escooter will stop itself later when it finds there is no weight on it. There is no requirement for Escooter driving condition. Escooter scooters can work well on flat roads, such as big squares, airport and hotels, but it can also work in forest, which roads are not flat enough but moves not as fast a flat roads. You can contact our sales for the total payment including shipping cost and then transfer the payment by T/T(Bank transfer) or Western Union.We will send to you via Express by Fedex,DHL or by air. You will receive it in 3--5 days. Please contact us with detailed trouble description. Our experienced support team will help you. You can fix yourself with guidance. If some parts are broken, you can change it yourself and send the old . Professional maintaining and cleaning are not necessary for Escooter. What you need do is keep the power is enough before your driving.Please keep it charged twice after its power run out completely.Please supplement power if you keep it not used over 3 weeks. You can use dry brush to clean tire and bottom or use wet soft cloth to clean its body. The concept of our afterserice is efficient,proffessional,satisfied. Our aim is that every customer make order withour any afterserice worry. The warranty is one year.It valid time start from the time you receive it. In warranty time: 1.When Escooter have problem,please contact the salesman,and send us the faulty video and describe the problem so that we can confirm the problem with our afterservice department. 2.Our afterservice department will deal with the problem within 24 hours because of time difference. 3.Our salesman will contact you and tell you the solve solution. If need replace parts,we will send you the new replacement parts immediately by DHL (3-4 days you can receive it) after your sending the important faulty parts. After sending new replacement parts,our salesman will send you the video about how to replace parts. After warranty time: 1.When Escooter have problem,please contact the salesman,and send us the faulty video and describe the problem so that we can confirm the problem with our afterservice department. 2.Our afterservice department will deal with the problem within 24 hours because of time difference. 3.Our salesman will contact you and tell you the solve solution. If need replace parts,our salesman will calculate all the cost of the parts for you,after your payment we will send you the new replacement parts immediately by DHL (3-4 days you can receive it). After sending new replacement parts,our salesman will send you the video about how to replace parts.